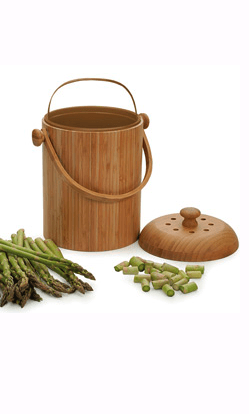 Collect your kitchen scraps in this handsome 3.25-quart countertop bamboo compost pail. Thoughtfully designed with a removable liner and dual charcoal filters in the lid that keep odors contained. The removable liner also has a handle for easy washing and convenient transport to outdoor compost bin. Witness and be a part of the unending cycle of life with your very own kitchen waste. Our Bamboo Compost Pail will help you do it in style. This handsome piece includes enhanced counter-top intelligence, with a plastic inside liner that can be easily removed and washed by hand or with the energy-saving dishwasher of your choice. I’ve used my compost pail now for years! The removable plastic pail is so convenient to carry outside to our compost pile, and easy to clean. Definitely makes our daily life easier!